Outspoken, direct, and ambitious, Kat Robinson isn’t thrilled to have a new boss—after all, if the timing had been different, she’d have been a shoe-in for Flynn’s job. But a single mom of a ten-year-old son knows where her priorities lay—with Brady, the light of her life. No way is she looking for a relationship and co-workers are always off limits. Too bad Flynn’s so darn hot, gorgeous, kind and authentic. I’m so jazzed! 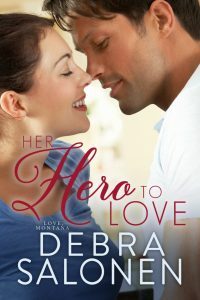 HERO made the “Must-Read Romances of 2015 List” from USAToday reviewer, Kathy Altman: USAToday. “What a vivid & vibrant story! Salonen captured me heart and soul with this heartfelt and emotional tale of love in many forms. I love the way that she brought Montana to life, the beauty and the danger of it apparent in every scene. The way in which SAR worked in action was amazing. It was so real and life like, I could feel the intensity of the situations. The variety of different situations that these characters had to deal with on a daily basis, bet they medical or familial or both, added a sense of poignancy and realism to the entire tale. Salonen brought each of them to life in a realistic and apparent way that also brought forth her sensitivity for the subject. I like the way that Brady was developed. His personal POV really let me see how he thinks and feels, as well as how he stands apart from what most consider ‘normal’. Surrounded by his loving mother and the ever present Flynn, who’s budding romance can’t be missed, this is an atypical familial unit that definitely drew me in. Flynn Bensen recognized the dream the minute it started in his sleeping mind. His old frenemy was back. The homestead looked exactly as he remembered it. An authentic log cabin in the high Sierra, aged to a rummy golden brown from dozens of summers. Its metal roof was rusted so poetically you’d have thought God used a fine-tipped paintbrush to add just the right touch of umber. The word bucolic came to mind. A word Flynn never used until that day last September. He tried to resist the pull. He knew how this story ended. Why subject myself to it again? I won’t fall into the trap. I’ll turn left instead of right. I’ll ignore the whinny. But the eerie sound filled his ears, sending a shiver through his body. The horse’s abject fear seized hold and wouldn’t let go. Suddenly, he was deep in the fire zone. Heat from the hundred-plus temperature made every breath pure agony. His pack felt as if he’d loaded it with lead weights. His legs seemed disconnected from his body as he pushed onward toward the horse pen. Two frightened animals, the whites of their eyes visible at every turn, paced, reared, and tossed their heads. Every whiff of smoke drove them closer to the brink of frenzy. This time will be different, he told himself. This time I’ll do it right. This time I’ll save her. The position of the old woman’s body never changed. Her head rested inches from the watering trough, face turned away, as if she couldn’t bear to watch what happened to her beloved animals. She seemed smaller in hindsight, fragile and delicate. Spikes of silver hair stuck out like a bad wig. But she was breathing…always breathing. Just enough to give him hope. “Stay with me, now. We can do this,” he said, picking her up in his arms like a small child. Why hadn’t he thought of that before? Nobody deserved to be tossed over a shoulder like a bag of rocks as he had that day. If he’d cradled her to his chest like a child, maybe she would have felt loved, respected, care for. Maybe she’d have stayed connected to him, to life. Someone shook him. Hard. The woman fell from his arms. He watched her drop into the flames of the fire that had been chasing them. He lost her. Again. He cursed and swung wildly, hoping to hurt whomever it was that made him drop her. Flynn blinked, coming back to the real world. Awareness washed over him like a splash of rainwater from a bucket. He sat up, shaking his head like a wet dog, and looked around. He was on his cot in the tent cabin he shared with Tucker and Justin. His best friends. Brothers-in-arm. Tucker “Mountie” Montgomery stood, arms akimbo, in baggie sweats and an army-green T-shirt. His scowl barely put a dent in his heart-throb handsome face. Even half-awake and pissed off he probably would have had his choice of groupies if any knew he was a wilderness firefighter in his day job. Justin squatted a foot or so away. His standard issue undershirt and thigh-length gray shorts emphasized his compact muscles–finely honed from his off-season occupation: free climbing. Flynn swiped at a bead of sweat that rolled into his eyes, stinging. “Another nightmare?” he asked. He threatened that every time. But Flynn couldn’t blame him for being upset. Tucker belonged to an elite, extremely well-paid troupe of dancers/entertainers that performed for women around the world on the off-season. He told everybody he couldn’t afford to lose valuable beauty sleep. His fans deserved it. “Sorry, man,” Flynn mumbled. His throat ached, as usual. After every nightmare, he’d awaken to a body that somehow actually believed he’d just survived a close brush with death on the fire line. Justin handed him the metal water bottle sitting on the floor beside the cot. They told him that every time this happened. What they didn’t know–because this was their first group deployment of the New Year–was he’d been wrestling with this dream since last fall when he volunteered to work a horrific fire near Yosemite National Park. Flynn smiled at that. False modesty wasn’t Tucker’s style. I must be in worse shape than I thought. “Flynn, it was her time,” Justin said, repeating an argument Flynn had heard from others. Even the coroner confirmed the victim’s chances had been small to none. The subdural hematoma caused by the impact from hitting the water trough would have been tough for even a healthy young person to survive. Flynn shifted sideways, his feet landing on the dirty canvas floor with a muffled thud. His friends were right. Flynn thought getting back on an active fire line would purge his guilt. The physicality and exhaustion that came from walking four miles from a drop zone to the leading edge of a fast-burning forest fire then beating Mother Nature into submission sounded like the answer. Surely after a ten-hour day he’d be too exhausted to dream. Tucker’s epithet echoed in the stillness, and may have been heard three tents over. Justin’s sigh seemed to start at the center of his soul and vibrate outward. Tucker and Justin exchanged a look. “He thought you might need a kick in the pants,” Tucker said, plopping down on the cot, crowding Flynn’s space like he always did. “I’ve been looking at property online for awhile and I think I’ve found the perfect spot for Mountie’s Most Awesome Montana Zipline and Enduro Course.” He flashed the grin that drove women in his audiences wild. Older women with more cash than sense, Flynn thought. But who was he to criticize? Tucker lived boldly, followed his dreams, and always came out smelling like a rose. The guy had more than enough money to risk on a short-lived investment. Flynn let out a long sigh. He’d been worried about breaking the news to his buddies. Maybe that tension is what triggered tonight’s episode. His nightmares had been coming less frequently–or so he told himself–since his visit to Marietta last November. Seeing his brother so happy, in love and looking toward the future, made the stark emptiness of Flynn’s life all the more disappointing by comparison. He put in his forty hours and did a little volunteer work with a couple of after school programs in the area, but his social life was nil when Justin and Tucker weren’t around. Would a change of venue rid Flynn of his nightmares? He didn’t know, but Ryker had made a fresh start in Marietta and found the woman of his dreams–the living, breathing, sexier than heck kind of woman. Maybe, Flynn would get lucky, too. But, honestly? He’d settle for a good night’s sleep. TO KEEP READING, CLICK HERE TO PURCHASE AT YOUR FAVORITE VENDOR: Books2Read.